Dimensions (L x W x H) 10.15" x 18.38" x 11.14"
MTP® connectors can also mounted in the fixtures that are compatible with a MPO-style connector. 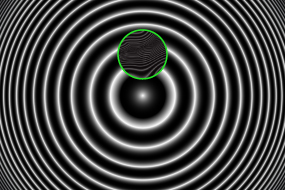 Defined as the measurable height difference on the connector surface using the interferometric fringes and camera bit depth. Interferometric scans are used to measure the fiber and connector geometry and compares the results against a database of industry-standard pass/fail conditions. The fiber is imaged as a dark circle while the center of the interference rings indicates the center of the connector surface. Thorlabs' Vytran® GL16 Fiber End Face Geometry Measurement Instrument is an easy-to-use system for measuring and imaging the end face geometry of single- and multi-fiber connectors. It uses a non-contact scanning white-light interferometric (SWLI) technique to provide high accuracy, repeatability, and reliability for fiber connector testing, particularly for pass/fail testing using IEC or Telcordia requirements. All the system components, such as the interferometer, precision optics, high-speed cameras, and control system, are fully integrated within an enclosed 10.15" x 18.38" x 11.14" housing and can be controlled locally through the 7" capacitive touchscreen display or remotely through a browser-based application. Fibers and patch cables are mounted for testing using interchangeable mounting fixtures; one GL16M4 Mounting Fixture is included and other fixtures can be purchased separately below. The GL16 inteferometer uses a wide-bandwidth 570 nm LED light source with a Michelson interferometric objective lens to measure the phase shift for step height changes as large as 35 µm. 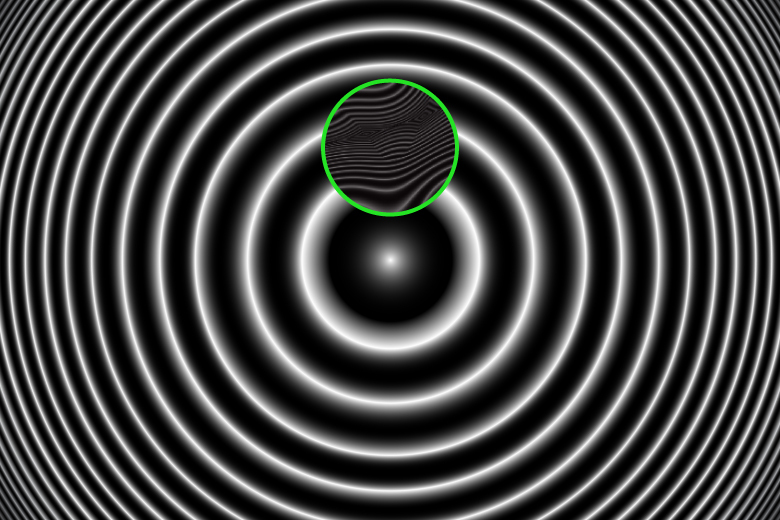 A piezoelectric stage moves the interferometric objective lens relative to the connector and collects the resultant interference patterns using a high-resolution camera. A 3D height map of the connector surface is created and then used to calculate the fiber geometry parameters for pass/fail testing (see the Measurement tab for details). 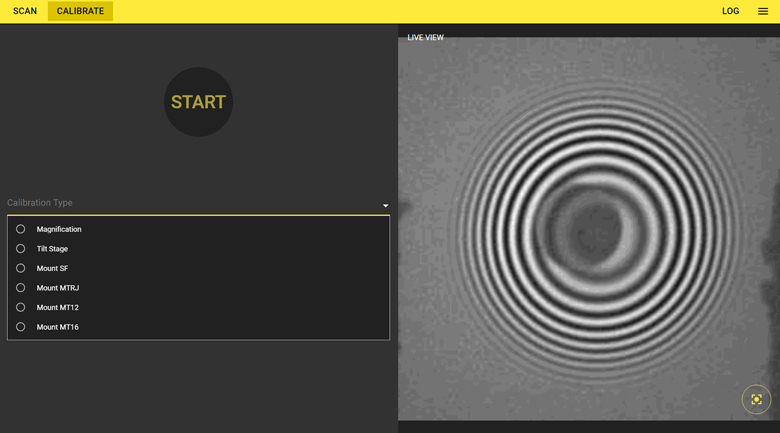 White light interferometry allows for a highly accurate measurement of a connector or fiber surface, and is able to characterize undercut or protruded fibers that would be missed using a monochromatic interferometer (see the Interferograms tab for details). 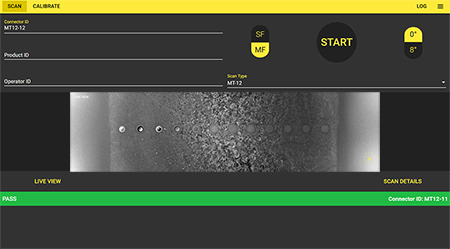 Control the interferometer using the integrated touch display and software featuring full programming of measurement and testing parameters. The GL16 software contains a database of IEC and Telcordia requirements for pass/fail testing; custom user test parameters can also be programmed and used (see the Software tab for details). An USB 3.0 port in the rear allows for control via an external mouse, keyboard, or barcode scanner. An Ethernet port is also provided for remote operation, diagnosis, and software updates. Mount the patch cable or fiber to be tested to a port located at the front of the system using an interchangeable mounting fixture, purchased separately below. The automated mounting stage can be tilted at a 0° or 8° angle for measurement of flat-polished or angle-polished (APC) connectors. NIST-traceable standards that provide confirmed calibration of magnification and tilt stage operation are included with each instrument. 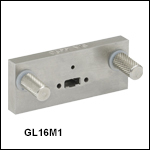 For single fiber patch cables, the GL16S1 and GL16S2 fixtures feature a flexure locking mechanism and aperture plate for alignment of the fiber end face with the interferometer. Mounts for connectors using Ø2.5 mm ferrules (e.g., FC/PC, FC/APC, SC/PC, SC/APC, or ST/PC connectors) or Ø.1.25 mm ferrules (e.g., LC/PC) are available. For multi-fiber patch cables, Thorlabs offers fixtures for mounting MT ferrules as well as MPO connectors for 12 or 16 fibers per row. Ferrules or connectors with multiple rows of fibers (up to 72 fibers total) can be mounted using these fixtures. These True Angle™ connector mounts feature an integrated aperture plate. Guide pins allow easy insertion of the connectors into the mount with repeatable positioning; this enables high accuracy measurements of the connector surface angle. One GL16M4 12-fiber, MT-style ferrule mount is included with each GL16 interferometer. 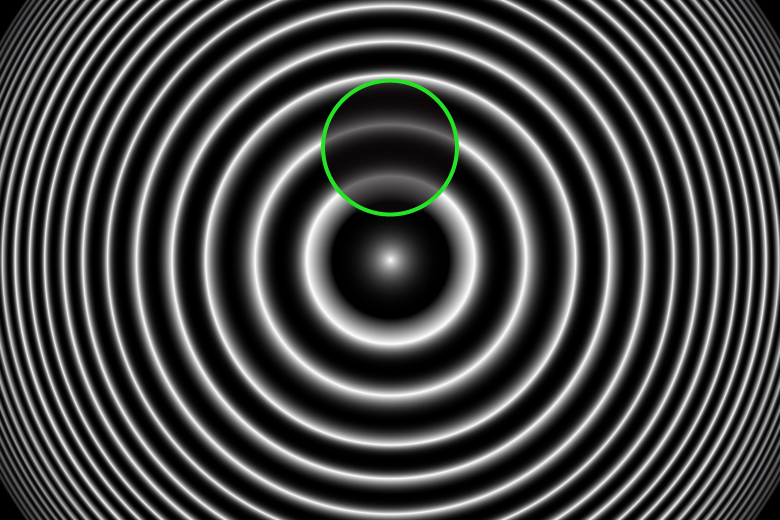 Defined as the 1σ variance for 50 consecutive measurements without moving the sample connector. Defined as the 1σ variance for 50 consecutive measurements while reinserting the sample connector after each measurement. These values are only measured when the scan is set up for FC/APC connectors or a connector with a flat polish. Figure 2: Diagram illustrating linear and angular apex offset in a single axis. The GL16 interferometer provides very accurate measurements of the fiber end face geometry. Unlike a fiber inspection scope that evaluates the fiber surface for scratches, dirt, and pits, an end face geometry interferometer measures the fit of the fiber and connector including parameters such as curvature and protruded/receded fiber tips. Displays the average curvature radius (in mm) for the connector end face. It is defined as the radius of the best-fit curvature over the specified fitting area calculated by using a least-squares method. Although typically a sphere is the best-fit model, for high or low radius of curvature, an ellipsoid may be used for a high or low radius of curvature. Displays the amount of undercut or protrusion (in nm) of the fiber in the connector. It is defined as the difference between the height at the center of the fiber and the projected height of the ferrule at the same location. The projected height of the ferrule can be determined using either a spherical method or planar method (shown in Figure 1). The spherical method is recommended in the TIA and IEC test procedures for FC/PC or FC/APC connectors, while the planar height method is often used for flat-polished connectors. 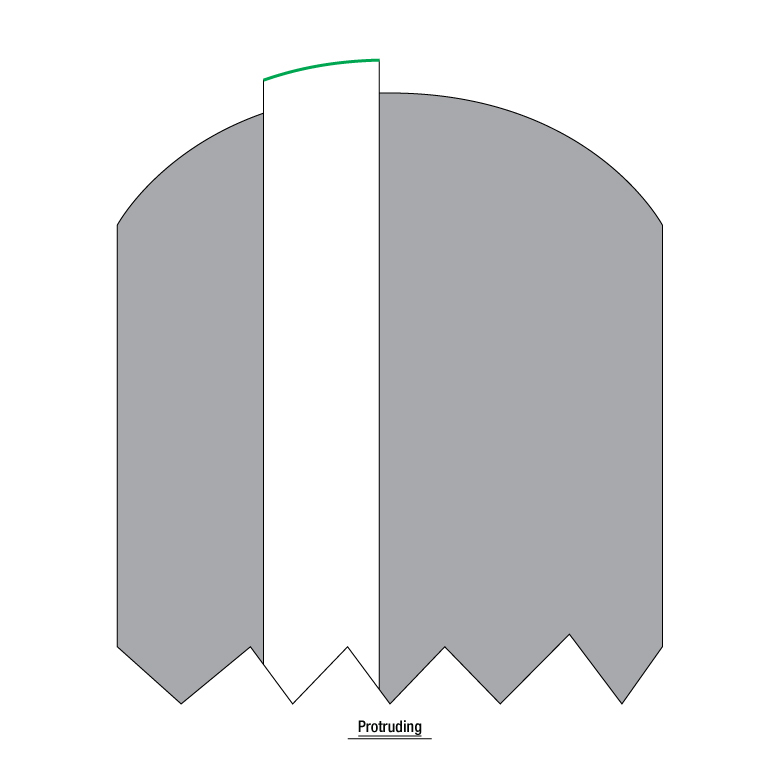 The apex offset is defined as the deviation of the apex of the ferrule's spherical end face from the center of the fiber (see Figure 2). The linear offset is defined as the distance from the apex (high point) of the ferrule’s spherical end face to the center of the fiber measured in a plane perpendicular to the fiber axis. Angular offset is the angle between a radial line through the high point of the polish and a radial line through the center of the fiber. These measurements are given in terms of their x and y components. 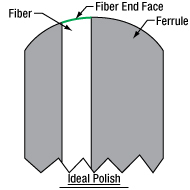 The polish angle is defined as the nominal tilt of the connector end face polish. 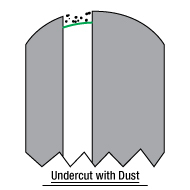 This value is only measured when the scan is set up for an angled polish connector (APC) or a connector with a flat end face polish. Displays the angular direction of the polish offset for APC connectors. The key error is defined as the angle of the line drawn from the fiber center to the end face apex. This value can be used to help refine or correct the procedure used to polish an angled connector surface. This value is only measured when the scan is set up for an APC connector. Displays the angular tilt of the plane that best fits the fiber end face area as defined in the cleaved fiber ruleset configuration. This tilt measurement is taken with respect to a plane perpendicular to the fiber's axis of propagation. This value is only measured when the scan is set up for a cleaved fiber with no ferrule or connector. Displays the angular direction of the cleaved fiber end face. This value is only measured when the scan is set up for a cleaved fiber with no ferrule or connector. Figure 4: Schematic illustrating core dip measurement for a single fiber. Figure 3: Diagram illustrating the fit planes for determining minus coplanarity for a 12-fiber multi-fiber connector. Displays the angular deviation (in degrees) of the connector end face from a plane perpendicular to the center lines of the guide holes. An end face angle is measured along both the X-axis and Y-axis of the plane. Indicates the angle of the plane that best fits all of the fiber end faces on the connector. The angle is defined relative to a plane perpendicular to the averaged center lines of the two connector guide holes. A fiber plane angle is measured along both the X-axis and Y-axis of the plane. For the case of a connector with only one row of fibers, the fiber array’s y angle is determined by a best fit to the ferrule. Displays the radius of curvature (ROC) for each fiber in the tested ferrule or connector. Each radius is determined by fitting an ideal sphere to the fiber end face. The minus coplanarity describes the fiber height difference between the least protruded (lowest) fiber and the best fit fiber plane for an array or line of fibers in a multi-fiber connector. 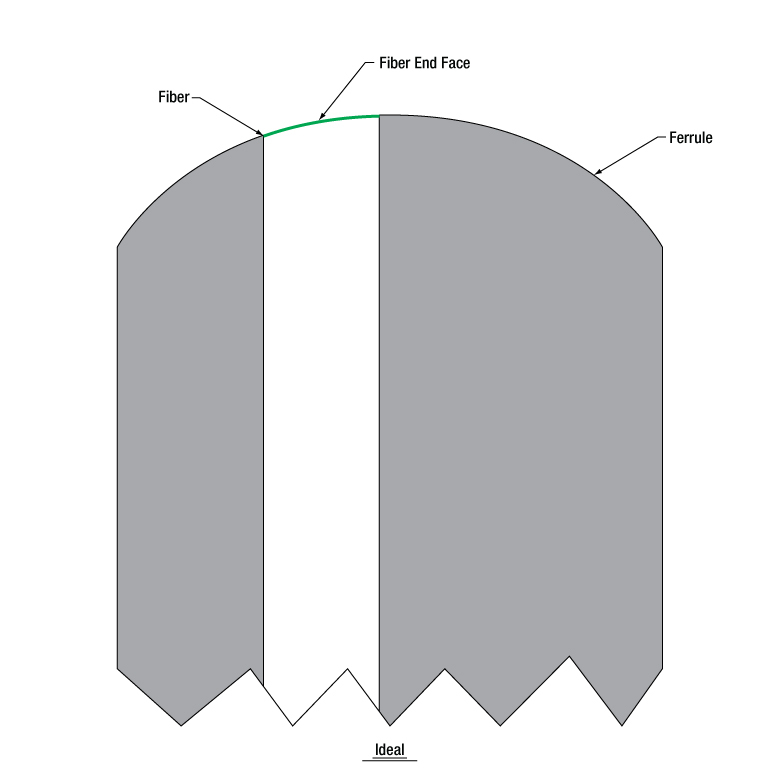 A low value indicates that the fiber end faces are nearly coplanar while a large value indicates a large variance in fiber height, which can lead to issues during fiber mating. As shown in Figure 3, the best fit coplanarity plane is the plane or line that best represents the fiber height of all fibers in the connector. The minus coplanarity and total coplanarity are both measured perpendicular to the best fit plane, not the connector surface plane. Core dip measures the dip (positive value) or protrusion (negative value) of the fiber core relative to the fiber cladding, which can increase insertion loss during mating. 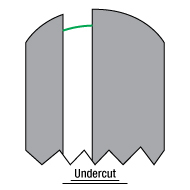 This typically occurs during the polishing process because of differences in the polishing rates between the fiber core, which is sometimes a softer material, and the fiber cladding. In a multi-fiber connector, significant amounts of core dip may affect the amount of light transmission between two connectors when mated. Core Dip is measured by fitting an ideal paraboloid to the curvature of the region of interest. A plane is then found that passes through points on this paraboloid at a specified radius away from the fiber center (15 µm for IEC industry standards). 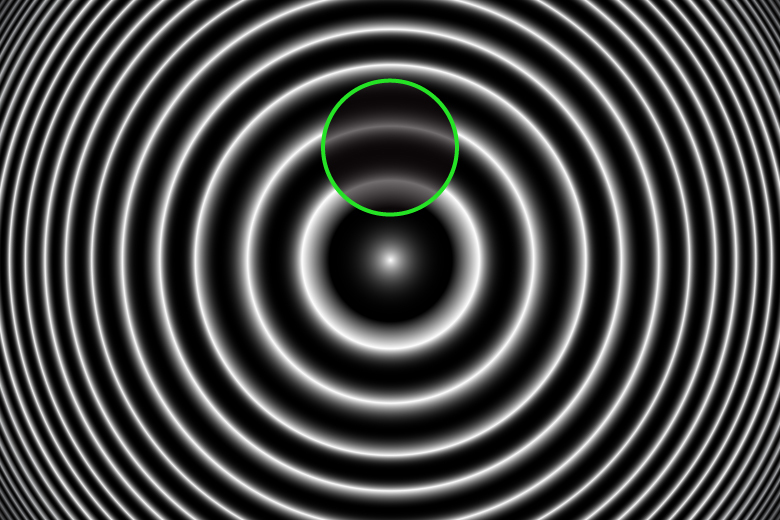 The core dip is the difference between the height on the plane at coordinates matching the position of the fiber center and the height of the lowest point on the fitted paraboloid. Figure 4 illustrates how to determine both the low point and the theoretical fiber height. The geometry limit is a calculated merit function that is used to quantitatively assess the geometric parameters of a multi-fiber connector end face, determine the acceptability for physical mating, and acts as a predictor for signal loss during mating. 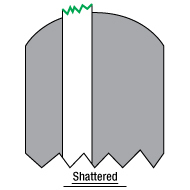 This calculation relates several parameters, including X-axis end face angle, minus coplanarity, and radius of curvature, to the characteristic ferrule compression force. For a given set of end face conditions, a low geometry limit indicates better mating performance. The upper limit of acceptable geometry limit values is set by IEC testing specifications. 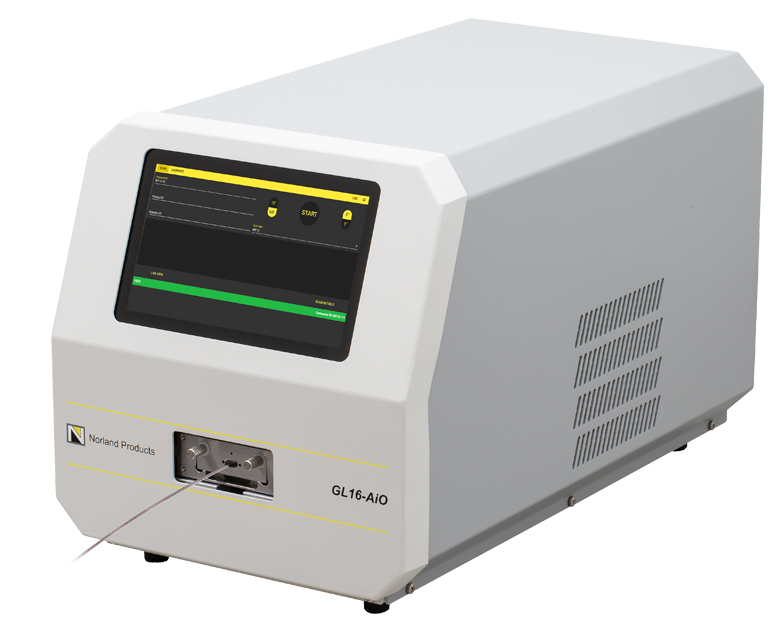 The GL16 Fiber End Face Interferometer features a measurement software program that is fully integrated into the system. The intuitive controls and customization options ensure that it is easy to use right out of the box while also providing sufficient flexibility to accommodate any user requirements during the measurement process. The GL16 interferometer is equipped with both local and remote system operation. Locally, the system can be controlled via the touch-screen display or using a keyboard or mouse peripheral via the USB 3.0 port located at the rear of the system. Remote control of the system can be accomplished by connecting the interferometer to a network via the Ethernet port located at the rear of the system and then accessing the controls via an easy-to-use browser application. 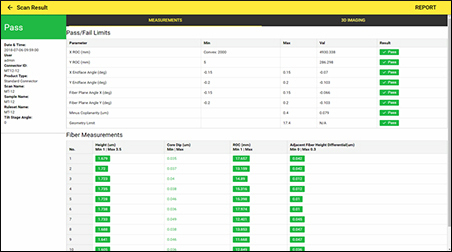 Measurement data in the form of .CSV or PDF format can be accessed and copied using the remote control functionality. When used with a multi-fiber connector, such as an MT-style ferrule or MTO-style connector, the software tailors the user interface, measurement parameters, and field of view to accommodate these connectors. 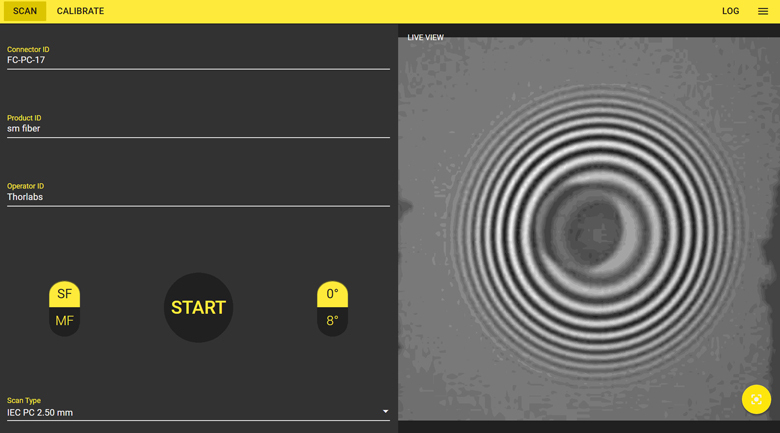 The GL16 interferometer includes scan setup profiles for MTO-style connectors by default. 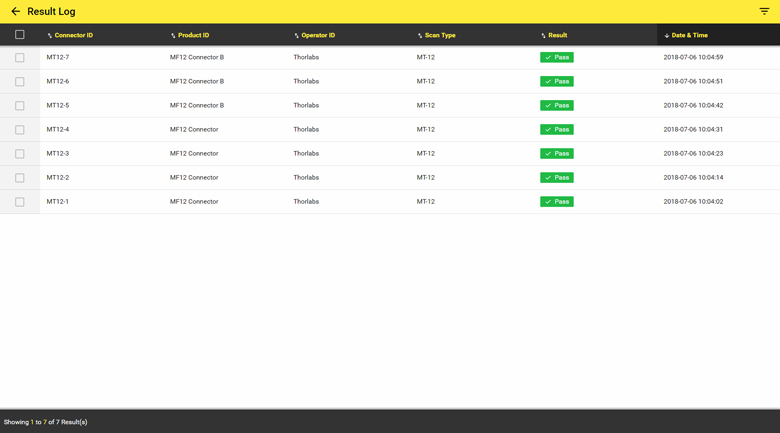 Additionally, users can create new profiles and parameter rulesets to accommodate other connectors via the scan setup dialog. 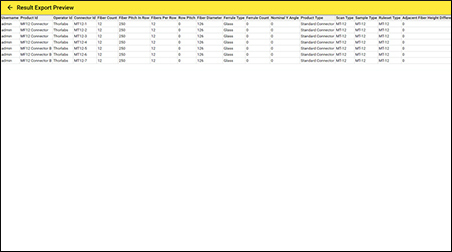 The images below show screenshots of the software when scanning a 12-fiber ferrule using an IEC standard ruleset. 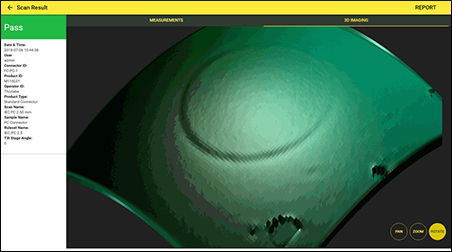 Displays main scan controls, live sample image, and the result of the last scan performed. When the system is first initialized, a live view image is not shown. This live image from an MT12 connector is displayed on the scan control screen (image to the left). The outer diameters of the 12 fibers mounted in the connector are visible in the scan. The yellow button in the lower right of the image is used to focus the view. 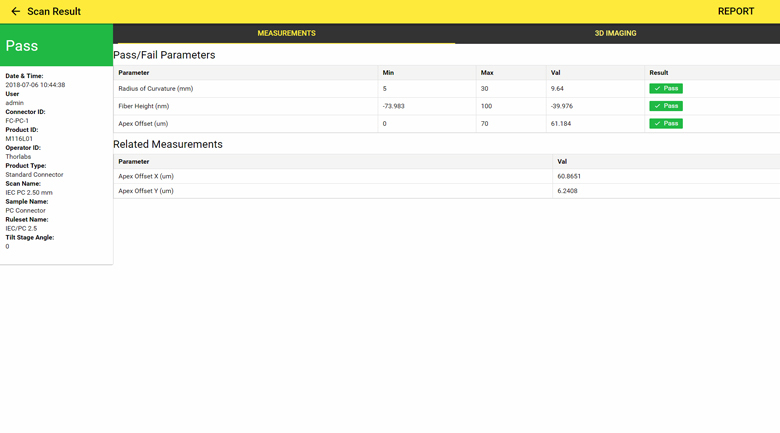 Displays the pass/fail limits of the scanned parameters, the measured result, and the pass/fail result for each fiber in the multi-fiber connector. The report can be exported to a printable scan report; click here for a sample. Displays the 3D image based on the results of the interferometric scan. 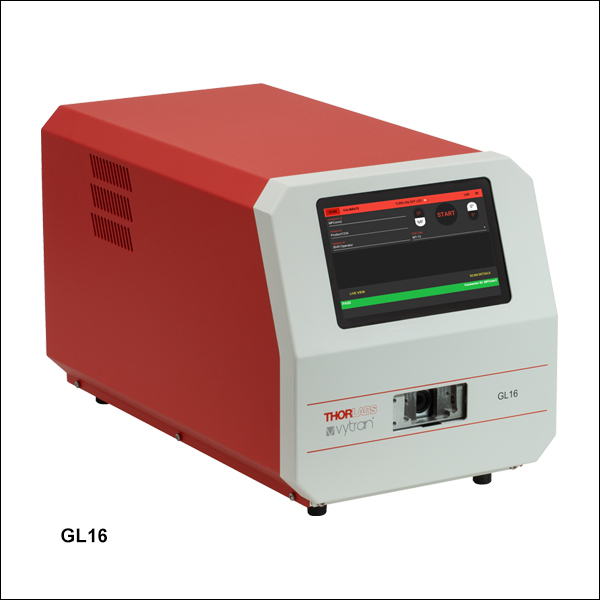 The GL16 interferometer can handle both multi-fiber and single-fiber connector types. When switching connector mounts, Thorlabs recommends performing a mount calibration using either the included calibration ferrule (multi-fiber connectors) or leveling tool (single-fiber connectors) and following the instructions on the calibration screen. Displays the calibration options available for magnification, tilt stage, and four types of connector mounts. Displays main scan controls, live sample image, and the live scan image from the sample. The outer diameters of the 12 fibers mounted in the connector are visible in the scan. The yellow button in the lower right of the image is used to focus the view. Displays the pass/fail limits of the scanned parameters, the measured result, and the pass/fail result for each parameter. The report can be exported to a printable scan report; click here for a sample. 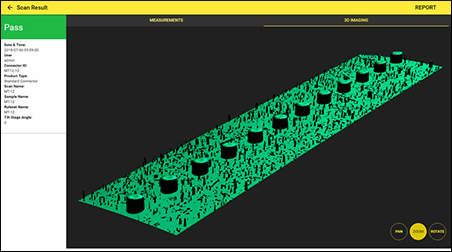 Results from a scan, including all physical parameters, are stored in an internal SQL database. 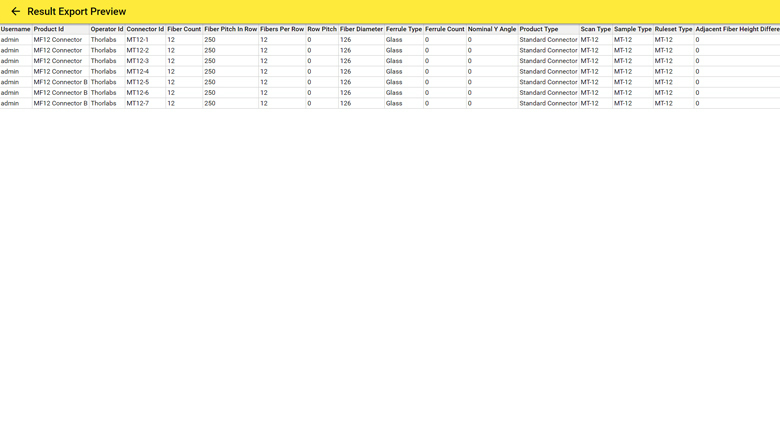 At the end of a successful scan, the result logs show the pass/fail status of each connector scanned and the cause(s) of a failed device. Further detail such as 3D scan images and a report of all measured parameters is available for each device scanned. All scan data reports can be exported in CSV file format as well as a PDF-format and can be viewed locally or through remote access. 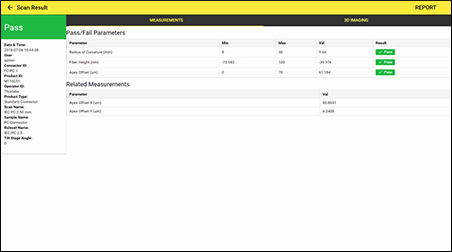 Exported measurements can be stored offline after downloading them via remote access. Displays all previously performed scans. 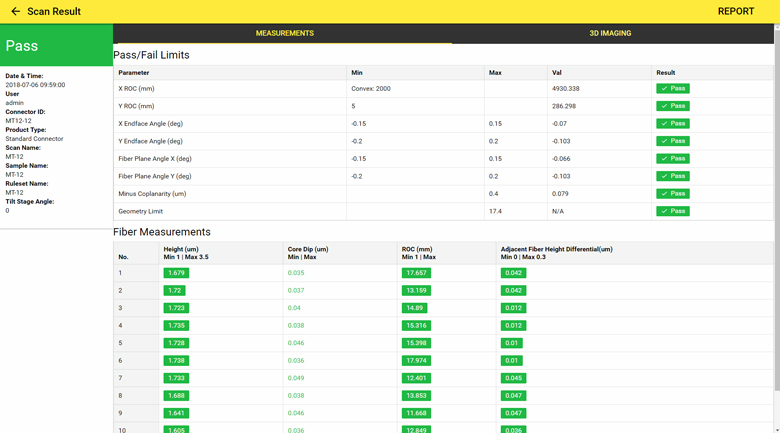 Each result can be opened to view detailed results such as parameter values and 3D images. Tests selected in the Result Logs can have their results and scan parameters exported to CSV format for easy viewing using a spreadsheet program. 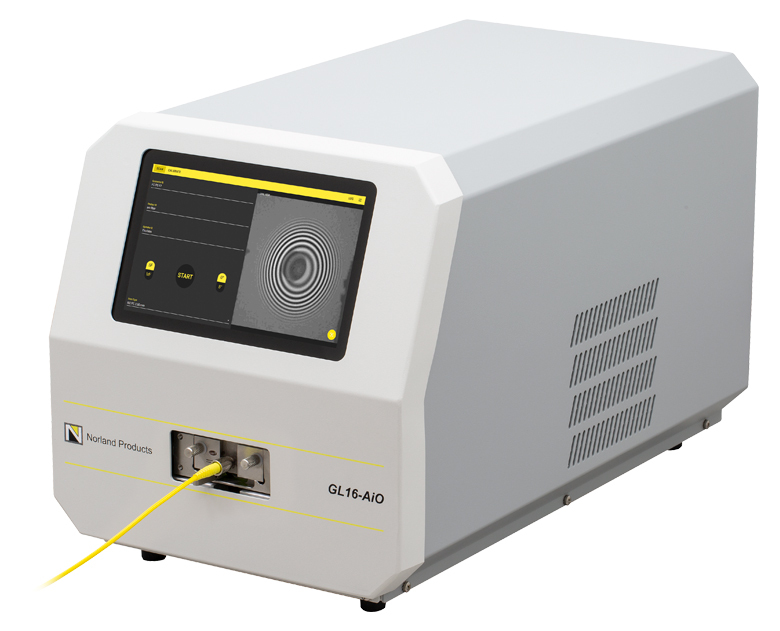 The GL16 Interferometer provides all the necessary components for fiber end face geometry measurement integrated into a compact housing with a 7" capacitive touch-screen display for local control. 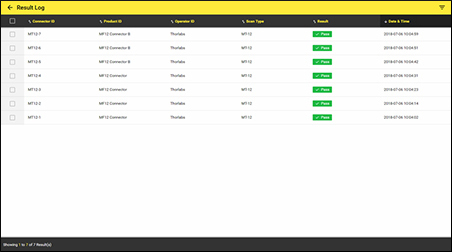 The intuitive software user interface is designed for ease of use while providing a high degree of customizability over testing and report export options. 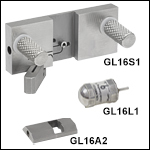 One GL16M4 Mounting Fixture is included; other fixtures can be purchased separately below. Each mounting fixture includes two knurled thumbscrews that are used to attach it to the sample port directly below the display. The sample port has a controllable, motorized stage that tilts to adjust for connectors with a 0° or 8° polish. Use the appropriate fixture insert (sold separately below) for the angled connector and perform a mount calibration when switching to a new mount. Thorlabs' single-fiber mounting fixtures use an integral leaf spring design to provide accurate and repeatable mounting of fiber patch cables in the GL16 interferometer. The GL16S2 fixture is compatible with Ø2.5 mm ferrules, as well as FC/PC, SC/PC, and ST/PC connectors. A GL16L2 Leveling Tool is required for calibration when changing mounting fixtures. 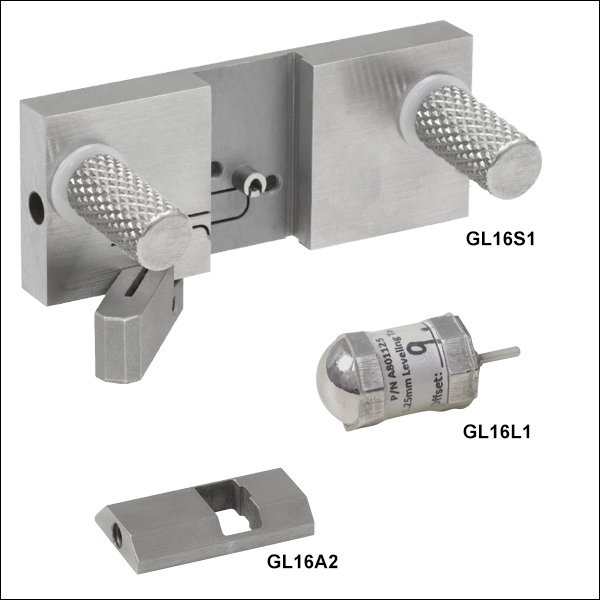 The GL16A1 and GL16A4 Fixture Inserts provide compatibility with 2.0 mm narrow key (Type R) and 2.2 mm wide key (Type N) FC/APC connectors, respectively. For compatibility with SC/APC connectors, use the GL16A3 Fixture Insert. Custom mounts are also available upon request by contacting Tech Support. The mounting fixture attaches to the tilt stage with two knurled thumbscrews. To mount a connector, first turn the locking lever to the left to open it, insert the connector into the mount until it bottoms out, and then turn the lever to the right to lock the connector in place. When mounting ferrules with an angled polish, such as FC/APC or SC/APC connectors, secure the appropriate fixture insert on the mounting fixture using a 0.05" hex key. Thorlabs' single-fiber mounting fixtures use an integral leaf spring design to provide accurate and repeatable mounting of fiber patch cables in the GL16 interferometer. The GL16S1 fixture is compatible with Ø1.25 mm ferrules and LC/PC connectors. 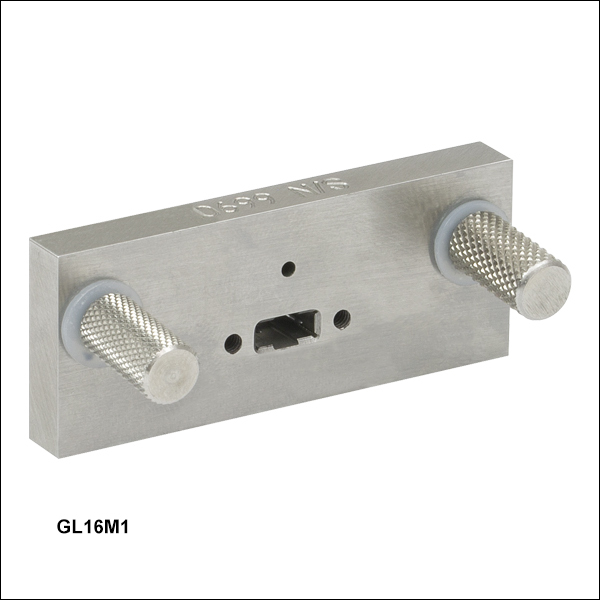 A GL16L1 Leveling Tool is required for calibration when changing mounting fixtures. 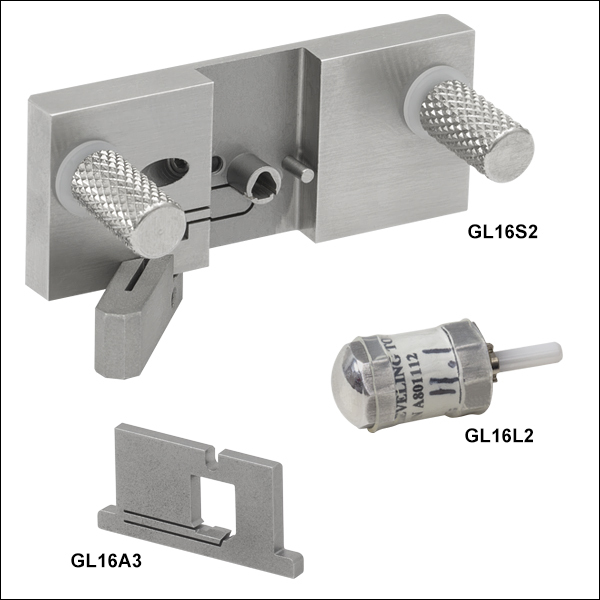 The GL16A2 Fixture Insert provides compatibility with LC/APC connectors by aligning the angled polish of these ferrules with the interferometer. Custom mounts are also available upon request by contacting Tech Support. The mounting fixture attaches to the tilt stage with two knurled thumbscrews. To mount a connector, first turn the locking lever to the left to open it, insert the connector into the mount until it bottoms out, and then turn the lever to the right to lock the connector in place. When mounting ferrules with an angled polish, such as LC/APC connectors, use the GL16A2 Fixture Insert. These True Angle Connector Mounting Fixtures use high-accuracy guide pins machined into a precision aperture plate to hold the connectors in alignment during the interferometer scan. By using the plane perpendicular to center lines of the connector guide holes as a reference flat, very accurate measurements of the connector surface are possible. Four mounting fixture options are available: we offer a 12-fiber row and 16-fiber row MT-style ferrule mounts and 12-fiber and 16-fiber row MPO-style fixtures. The MPO-style fixtures can also be used with MTP connectors. To insert the connector, slide it into the mount onto the guide pins using a motion similar to when two multi-fiber connectors are mated in a bulkhead or mating sleeve. Aperture plates with guide holes for mounting connectors with pins are available upon request; please contact Tech Support with inquiries.